This peppermint - free toothpaste with gentle mineral abrasive particles and pure plant extracts thoroughly cleanses and protects your teeth. Regular brushing helps to avoid the build - up of plaque. 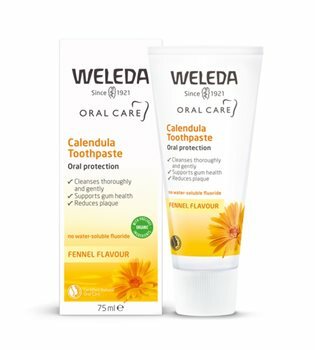 Calendula, a soothing herb, aids in keeping gums and oral cavities in good condition. Gentle fennel oil is a fresh - tasting alternative to peppermint oil and keeps your mouth feeling clean and refreshed. Ideal when taking Homeopathic medicines. Directions: Regular brushing keeps mouth, teeth and gums healthy and avoids the build-up of plaque.